Out of everything that can go wrong inside of the home, water damaged flooring to your carpets or floorboards is perhaps the most upsetting and potentially the most severe in terms of impact. On top of the obvious damage that it can cause, such as visually and the odour it leaves, water damaged flooring, especially carpets, can also create a plethora of health hazards for both you and your family. A professional carpet cleaning Melbourne service, particularly one that specialises in flood restoration of carpets or flooring, can treat and remove these issues. But what about the instant that the water damage has happened? Is there anything that can be done to at least soften the blow of the damage and allow you to conduct your daily life in a relatively normal manner? The good news is, yes, there is – four of them in fact. Whilst they aren’t a substitute for a professional job being conducted, following these tips in the event of water damage can make your life a little less stressful, as well as often making the restoration process slightly quicker and easier. Even better is that these handy little tips to follow are not labour intrusive, and can be done quickly. A particular problem with many houses that are affected by flood damage is that standing water can pool in low lying areas of the home. This often occurs in older homes or those with raised doorsteps, where the floor cornices or mouldings can act as a barrier for the water to escape the home naturally. It can also be an issue for those that have hard floorings, although not necessarily limited to this example. One easy way to remove standing water is to get the old mop out and gently sweep it either out of the home or into an area where it can be collected easily. We cannot stress the word gently enough, as harsh strokes with the mop are likely to cause cornrowing on carpeted surfaces, which could ruin the look of the carpet later on. Gently dab the area until the mop has absorbed most of the standing water If you do not have a mop, then a broom can be used too, although it will be harder and you will have to take exceptional care with the ease of your strokes. 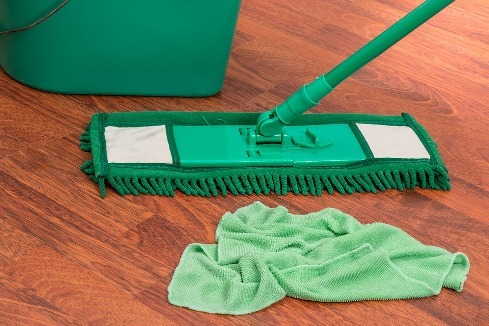 If you are willing to spend a little money, then a butterfly mop will provide the most benefit. These can be bought relatively cheaply, and are the best way to remove standing water for those that find it in a concealed area of the home where it isn’t as easy to just simply move it out the door. Whilst removing standing water goes a long way, the main issue associated with water damaged carpets and flooring is often the dampness left behind. This is a huge problem for carpeted areas, as despite there being no trace of pooled water, it can often be found seeped deep into the fibres and the underlay of the carpet. If left untreated, the carpet can shrink and will require replacement. One way to make sure that carpets are free of any underlying dampness is to utilise any towels or sponges that you may have. Lay them over the affected areas and press heavily down. Whilst this won’t remove all of the dampness, it will help to at least draw water from the underlay, and will go a long way to making sure that your carpet can be saved. If you own hardwood floors, this same trick will help to make sure that there is no damage done to the joints in between your floorboards, causing rot or in extreme cases separating the floorboards entirely. If you are wanting to make doubly sure that this issue is taken care of, feel free to go over the gaps in between the floorboards with a towel or a cloth. As we mentioned before, one big issue with flood damage, especially water damaged carpets, is how it creates the perfect bed for mould, mildew, and other harmful health hazards to form. This can only truly be taken care of through professional work and treatment, but making sure the area has access to fresh air will go a long way to mitigating the problem. By keeping the area open, you are changing the climate in which mould and mildew can flourish and thrive. It will also help to make sure that any lingering odour caused either by the dampness or the actual musty smell of the flood water will be lessened or in some cases completely removed. Whilst this provides more benefit for water damaged carpets, this too will also help those that have suffered flood damaged hardwood floorboards, due to the removal of any odours. In cases where the affected room has many windows, and given the right climate, it can also help aid the drying process of your floorboards to a certain degree. That’s right, your air conditioner can be your best friend during times of flood damage. Should you have one, turn it on to a cool setting and make sure that it circulates around the affected area. Not only will this help to remove any odours and create a drier climate to aid the process, but it will also stop the onset of mould and mildew dead in its tracks. Dehumidifiers can also help in this regard too, albeit in a smaller and more localised way. If you happen to have one, place it in the affected area and make sure that its effects are flowing onto the water damaged carpet or floorboards. A cool air fan can also be used, but take care to make sure that the air created is not just moving the water around. This can be mitigated by making sure the affected area is as dry as possible prior to turning the fan on. Whilst there is no substitute for professional flood restoration for water damaged carpets or floorboards, these little tips will help to make the area at least liveable and remove any potential health hazards. Also remember that taking action immediately if any flood damage has occurred will go a long way to make sure that any water damage is not permanent, resulting in complete carpet or flooring replacement, which can cost thousands.